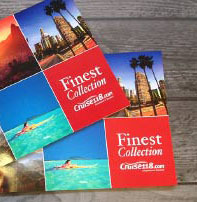 For many cruiser, shopping is an important part of the experience in port – whether it’s picking up a souvenir or two or going all-out to re-stock the wardrobe with a host of foreign fashions. So, to provide you with a little inspiration for the location for both your cruise and your retail therapy session, here’s a look at some of the world’s best shopping destinations you can visit on a cruise. One of the most enduring and popular destinations on Mediterranean cruises, Barca has a little of everything; beautiful beaches, breathtaking architecture and shopping options galore, with everything from modern complexes to traditional markets to choose from. This mile-long pedestrianised street stretches from the old city centre to the famous Christopher Columbus monument. The pedestrianised nature of the Las Ramblas district means you can wander around at your leisure, take your time and take a break in one of the many cafes or restaurants. Art’s big in Barcelona and as such, the district is a great place to pick up a piece or two. This South American cruise favourite is not just famous for being the birthplace of the tango and is thought by many to be the style capital of the continent. Style means shops and naturally, there are plenty of upscale shopping malls and markets. This large shopping mall is a favourite with tourists and locals alike and has been designed to look like Milan’s celebrated Gallerie Vittorio Emanuele shopping centre. As far as retail’s concerned, Buenos Aires is one of the world’s most celebrated destinations when it comes to leather. Jewellery is also a firm favourite. As one of the world’s most celebrated duty free meccas, the Caribbean earns a place on the list but of course, there are hundreds of destinations to choose from. Philipsburg is a popular duty-free stop-off for cruise visitors, particularly those in search of top-end clothes and jewellery, while St Kitts’ Port Zante in Basseterre boasts many shops and is particularly good for spirits. Bridgetown, meanwhile is the capital of Barbados and its famous Broad Street is the place to go if you’re looking for a boutique or two. The duty-free aspect means there are plenty of potential bargains to be had – even better if you’re on a cruise from the UK, as you won’t have as many weight restriction issues. The United Arab Emirates’ showcase of excess and opulence oozes wealth and is one of the must-visit destinations on Middle East cruises, especially when it comes to a really big spend. Even if you don’t have a big budget, it’s worth experiencing for the sheer wow-factor. It couldn’t really be anywhere else other than the world’s biggest shopping centre, the Dubai Mall, which boasts over 1,200 shops, four floors and is a major tourist attraction in itself. It’s fair to say you could find pretty much anything you wanted here but if you’re in search of a little serenity amid the shopping frenzy, the mall’s also home to the Dubai aquarium. A style capital and home to what many industry gurus consider to be the world’s most important fashion district, Milan’s certainly the place to stock up on togs and you can visit it on a Mediterranean cruise excursion from Genoa. This is the aforementioned district and it’s here that you’ll find such iconic brands as Dolce & Gabbana, Prada and Versace. If you’ve always dreamed of embarking on a high-end, once in a lifetime fashion splurge, then this is the place. The legendary markets or souks of this huge, ancient and fascinating city are one of its biggest tourist draws and the perfect place to find crafts and cuisine. As far as authentic goods are concerned, it’s certainly one of the best shopping destinations to visit on a cruise. In contrast, the city boasts its fair share of modern malls, too. As you would expect from the name, this is the granddaddy of the city’s old-school shopping destinations, which simply must be visited if you’re in the city and a true assault on all of the senses. This is indeed a great place to pick up some authentic Turkish Delight (locally known as Lokum), Turkish tea and all manner of traditional pottery and woven crafts. One of the most famous cities in the world is naturally one of the best shopping destinations to visit on a cruise. As well as being the USA’s fashion capital, it’s a great place to find pretty much everything else, too. From a lowly New York Yankees souvenir to a specialised vintage gift or a shopping mall bargain to a piece of art – it’s all here. It’s hard to pick one with New York. Head over to 34th street near Broadway to visit the legendary Macy’s department store, or window shop and dream with a trip along Madison Avenue. Great for … Specialist shoppers, discount lovers, fans of American… everything! Like any major world city, New York is a place where you can find almost anything you want. The difference is, in many cases the streets and shops are tourist attractions and famous destinations in their own right. Singapore’s a modern mega city, built with the shopper in mind and indeed, it’s considered a national pastime. A popular destination a Far East cruise, you needn’t worry about getting hot and bothered as all the shops and malls there are air-conditioned. Orchard Road is the place to be seen and the home of the city’s finest designer shops and boutiques. The Tanglin shopping centre on the road is a great place to find antiques, too. While you can pick up pretty much anything in Singapore, you’ll be spoiled for choice when it comes to clothing outlets. Video games are big business and usually cheaper than back home, while the latest mobile devices are readily available, cheap and always unlocked. If you’re in search of the next big thing, or something to take back home to impress friends and family, be sure to set aside a little, or indeed, a lot of time to experience the shopping districts of this futuristic city. A neon-lit place of pilgrimage for all those who worship at the altar of electronic, this is the place to go to get a glimpse of the future. This is the mind-boggling Tokyo you always hear about, so be sure to visit and see it for yourself. And anything electrical, really. Sony Plaza is a great place within the district for consumer goods but Akihabara’s also the best place to go for Anime and Manga souvenirs, too. Here at Cruise118, our dedicated team of cruise concierge have a wealth of destination experience. If you’d like any help in planning your next cruise, please give us a call on 0207 980 2847.